GrabHitch: Get $50 when you sign up! Use referral code ‘HITCH2UA‘ and get an additional $50 worth of Under Armour vouchers after you complete your first two GrabHitch ride as a Hitch driver! Use On-the-Go when you can’t find suitable matches in advance. Or if you’re always on the go! Tell us where you’re going and we’ll match you with real-time requests from riders located less than 10 minutes from where you currently are. Once you’ve accepted a ride, simply proceed to the pick-up point immediately. No need for scheduling or extra coordinating! Accept or reject matches, it’s your call. But if you’ve accepted, don’t cancel on your poor rider who is right there waiting for you! Recover up to $140 a week just by doing rides daily! Pick up 8 passengers throughout the week and pay for about one full tank of petrol. 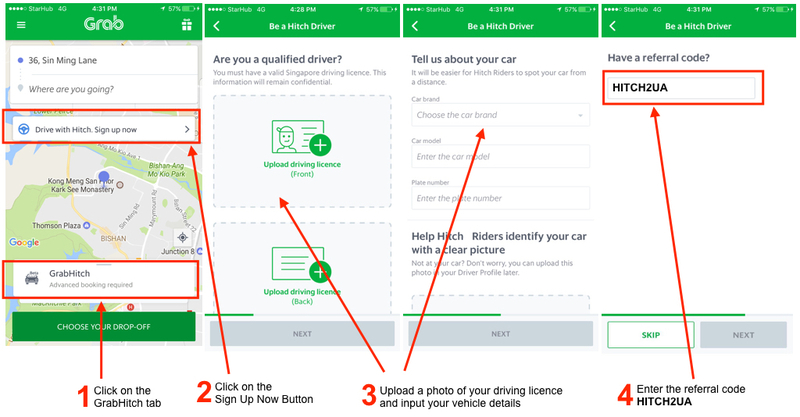 This incentive is only eligible for new drivers who sign up and successfully complete 2 Hitch rides as a driver between 13 November 2017 @ 00:00 hours – 30 November 2017 @ 23:59 hours. New drivers must sign up with the referral code HITCHUA in order to qualify for the $50 voucher incentive. The processing of the $50 vouchers will only be conducted after the incentive period has ended (post-30th November 2017). Please allow up to 10 working days for the processing of the $50 vouchers. Have questions? Email us at support.sg@grab.com with subject “HITCHUA” and we will get back to you in 2-3 business days.